Andrew Weaver, the B.C. Green Party leader, says "restoring public trust must be every MLA’s priority at this moment in time." The B.C. NDP and B.C. Green Party are calling on B.C. 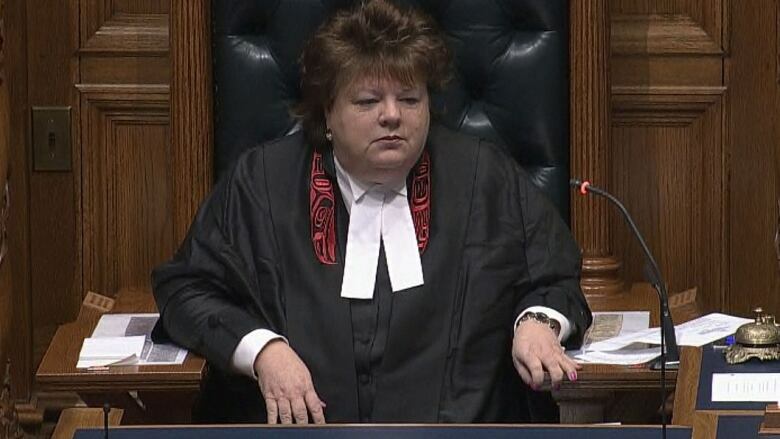 Liberal MLA Linda Reid to answer for her own connection to the ongoing expenses scandal at the B.C. Legislature. Monday's explosive report from Speaker of the House Darryl Plecas revealed two senior B.C. Legislature officials — Clerk of the House Craig James and Sergeant-at-Arms Gary Lenz — are being investigated for allegedly fraudulent and flagrant overspending, "lavish" trips overseas, inappropriate expense claims, cash payouts and misappropriating liquor from the legislature. One of the most costly expenses was a lump sum retirement allowance of $257,988.38 paid to James in 2012. Reid, one of the legislature's longest-serving MLAs, had been Speaker from 2013 to 2017 and deputy Speaker from 2009 to 2013, a time when many of the alleged incidents being investigated took place. NDP MLA Gary Begg said British Columbians deserve answers about what she knew and why she didn't act. "It's disturbing that Linda Reid kept silent even though she knew the clerk may have collected over a quarter million dollars improperly. We see evidence of inappropriate spending going back years under BC Liberal Speakers, and there's still a lot we don't know," Begg said. In her statement, Reid — who currently serves as assistant deputy Speaker — said she was "encouraged to see the Legislative Assembly Management Committee unanimously approve a comprehensive financial audit of the issues raised in the report from the Speaker." "As the auditor conducts their investigation, I will make myself fully available," Reid wrote. "I will work with the auditor and any other investigators to ensure the protection of taxpayer dollars. I feel it's important to respect the process of the current investigations in order to ensure the public is provided with a full account of the entire situation." B.C. Green Party Leader Andrew Weaver called on Reid to step aside from her position as assistant deputy Speaker, referencing an interview with whistleblower Connor Gibson by Global News. In its report, Gibson says he was asked by Reid to file what he describes as an inappropriate expense. "It is for that reason that today I am calling for MLA Reid to step aside as Assistant Deputy Speaker of the House. Our focus at this time must be on restoring public trust in our democratic institutions. I cannot see how that is possible when one of the individuals named by this whistleblower is still holding a position of power and oversight in the Legislature," Weaver said in a statement. CBC has reached out to Reid to put this particular allegation to her but has yet to receive a response. Clerk of the House Craig James and Sergeant-at-Arms Gary Lenz were both suspended Nov. 20. They have denied all wrongdoing.